Have you ever heard of Sleeping Queens? Every year we get a new game during the holidays and this card game was a HUGE hit. It’s appealing to kids of all ages and is a perfect choice for our game of the month series. The basic goal of Sleeping Queens is to collect queen cards by either waking them up, or stealing them from another player. How many cards you aim to collect depends on if you are playing for points, and how many players are at the table. Players wake up queens by drawing and playing king cards. Action cards such as the knight, sleeping potion, magic wand, dragon and jester cards allow players to steal or counteract others’ moves. Players attempt to gain action cards by exchanging number cards from the draw pile. Each queen is assigned a point value. Players attempt to collect the required number of queens OR the required number of points. We found the game to be less cut-throat if we played for the number of cards, instead of the point value. Players turn in number cards at the beginning of each turn based on whether or not they add up or match. For example, if a player holds a 2, 3 and 5, he can exchange them for 3 new cards because 2+3=5. He must declare the equation before the exchange. If a player holds 2 sixes, he can exchange the pair. Younger kids who are still working on basic addition skills can have a list of math facts in front of them to help them. Sleeping Queens is easy to learn. The manufacturer’s suggested age is 8 and up, however my newly-6 year old learned easily and I think 5 year olds could play, too. My favorite way of introducing a new game to my youngest son is to play with him on a team until he learns the instructions. It has also won a Dr. Toy Smart Play Smart Toy award. 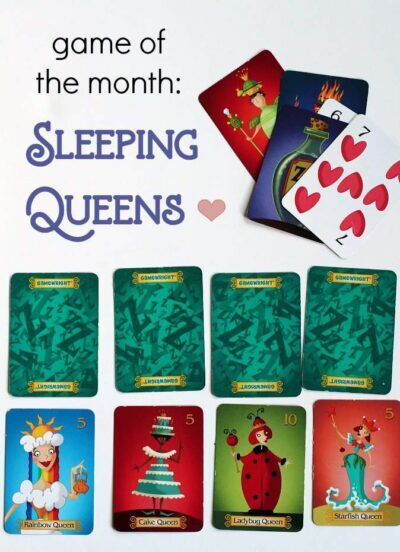 Have you ever played Sleeping Queens? My girls love Sleeping Queens. It’s frequently requested for family game night. We altered the rules slightly once they learned multiplication and division, so that they had to use a multiplication or division problem to get rid of number cards. My youngest, who is still on addition and subtraction facts continues to use that as her getting-rid-of-number-cards. Our house rules also state that you can use equivalency equations to get rid of cards, for example “6+4 equals 8+2”. This lets them exchange four cards at once, which helps move things along when you’ve got a handful of number cards. That is a great suggestion! Thanks! I am going to try that, too. My 6 year old daughter LOVES Sleeping Queens. We played it so many times last summer that I was going a little crazy. 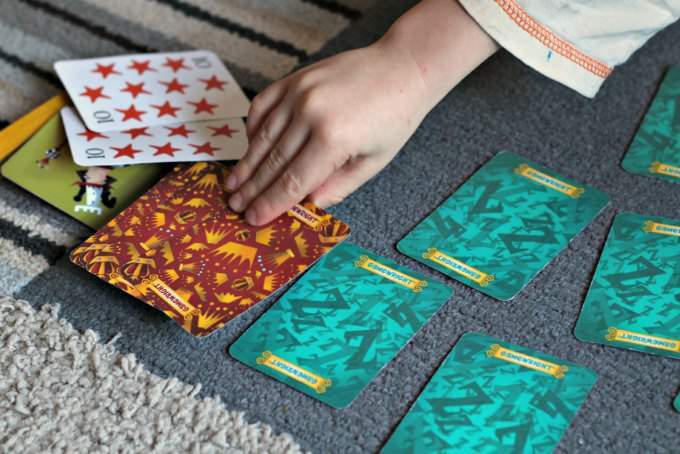 One of the ways that we make this work for our younger kids is that everyone puts their cards in front of them, face up, rather than holding them in their hands. You can see what everyone has, which makes the strategy piece easier. Per your suggestion we bought this game to play this summer. My kids love it! It’s the game they request to play every day. My youngest just turned 3 and we have played enough that he can play by himself now. He doesn’t use equations to get rid of cards, but he has figured out now that he can put down matches. In fact, we played tonight and he did not need one bit of help. He even held the cards in his hand instead of laying them out in front of him. This just shows how after playing for a while the younger kiddos can grasp the concept. Great game. We love it! Julie, This makes me so happy! Thank you for taking the time to let me know how much you enjoyed the game.